Portrait, Carl Gordon Staats. Image available on the Internet and included in accordance with Title 17 U.S.C. Section 107. Amicable Building, Waco. Courtesy of Baylor University Libraries. Image available on the Internet and included in accordance with Title 17 U.S.C. Section 107. First National Bank Building, Houston, 1913. Image available on the Internet and included in accordance with Title 17 U.S.C. Section 107. STAATS, CARL G. (1871–1928). Carl Gordon Staats, architect, was born in New York City on April 19, 1871, the son of Frederick and Anna Staats. He was reared and educated in New York. In 1891 he was hired by San Antonio architect James Riely Gordon. Staats worked for Gordon until 1898, when he moved to Fort Worth to work as a draftsman in the office of Marshall R. Sanguinet. In 1902 the two formed a partnership under the name Sanguinet and Staats. The firm, headquartered in Fort Worth, rapidly developed into one of the state's largest general-architecture offices and designed numerous buildings in the major cities of Texas and across the Southwest. Staats was apparently the principal designer, and Sanguinet concentrated on business matters. Though Sanguinet and Staats produced buildings of all types, they were best known for their contributions to skyscraper design. 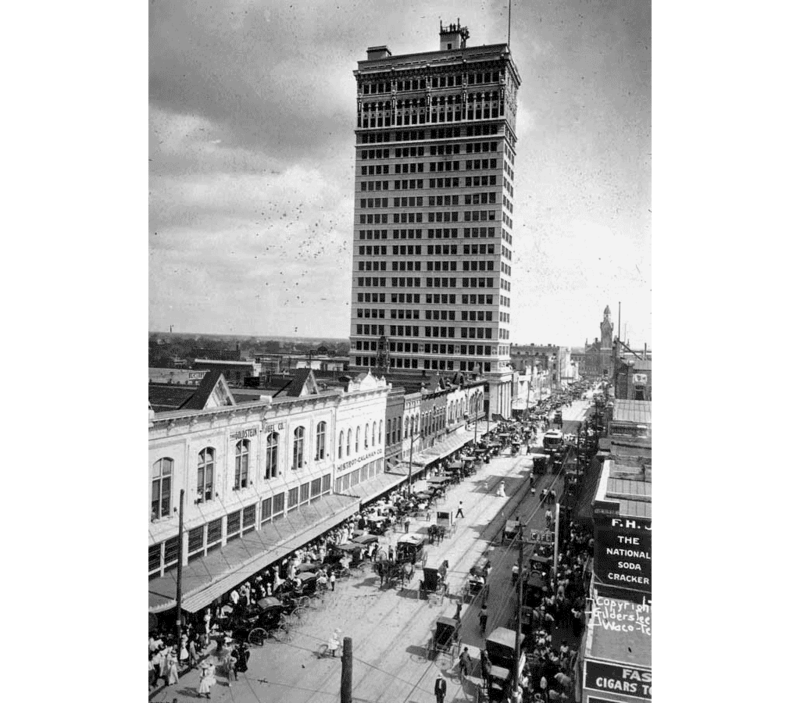 Between 1902 and the mid-1920s the firm produced skyscrapers for every large city in Texas, including the twenty-story Amicable Building in Waco (1911), for a time the tallest building in the Southwest. The majority of Staats's designs were in the reigning classical Beaux-Arts style, but over the course of his career he also produced works in a variety of architectural idioms, from the Neo-Gothic to the Prairie School style. Among the most important buildings attributed to Staats are the Wilson Building in Dallas (1903), First National Bank Building in Houston (1905), the Paul Building in Houston (1907), the First National Bank Building in San Antonio (date unknown), and the Houston Post-Dispatch Building (1926). Staats retired around 1924, and in 1926 he and Sanguinet sold their remaining interest in the firm to Wyatt C. Hedrick. Staats married Mollie Kline of San Antonio and, after her death in 1904, Mary Jacox of Temple. He was the father of seven children. He was a Catholic and a member of the Rivercrest Country Club in Fort Worth, the Fort Worth Club, the Knights of Columbus, and the American Institute of Architects. Staats was diagnosed as having tuberculosis after an accident in 1902 and spent the last four years of his life as an invalid in a sanatorium in San Antonio. He died in there on June 2, 1928, and was buried in Fort Worth. Stephen Fox, "Sanguinet and Staats in Houston, 1903–1926," Perspective 12 (Spring 1983). Michael C. Hoffmeyer, "Public Buildings of Sanguinet and Staats," Perspective 10 (Spring 1981). Houston Post-Dispatch, June 3, 1928. Jamie L. Lofgren, Early Texas Skyscraper: A History of the Skyscraper Style (M.A. thesis, University of Texas at Austin, 1987). San Antonio Express, June 3, 1928. Sanguinet and Staats-Hedrick Collection, Architecture and Planning Library, University of Texas at Austin. Handbook of Texas Online, Christopher Long, "STAATS, CARL G.," accessed April 18, 2019, http://www.tshaonline.org/handbook/online/articles/fstbd.